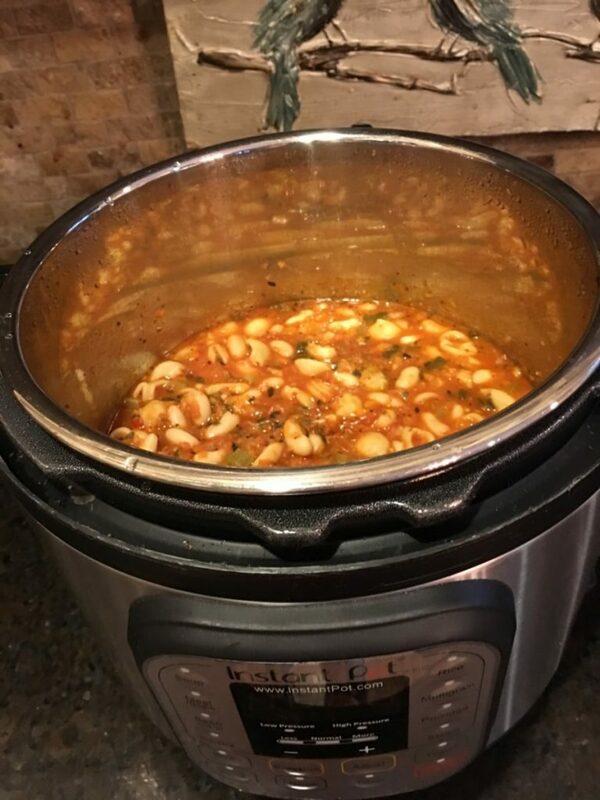 You can make healthy, delicious minestrone soup in minutes using the Instant Pot or in a few hours using a slow cooker. Either way, it is a home run soup your family will love. I cannot rave enough about my new favorite cooking appliance~the Instant Pot.. I bought it for $65 on amazon prime day a few weeks ago and have used it myriad times since. It has been a game changer for me in terms of getting good food on the table quickly. Since several friends have also purchased an Instant Pot and asked for recipes, I’ll be sharing them as I make them myself. If you don’t have an Instant Pot, all recipes can be easily adapted to your cooking method of choice. 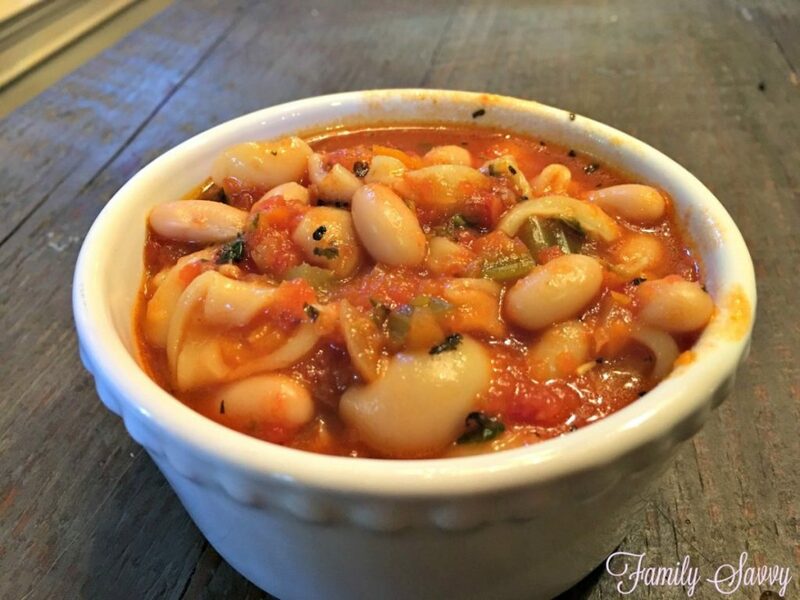 If you use an Instant Pot, this yummy minestrone soup can be made in roughly 30 minutes start to finish; however, you can make this soup in a slow cooker if you have several hours. Trust me, the quick cooking time is imperceeptible in the finished product. The soup tastes rich and complex and like it has simmered for hours. Look at the transformation from whole food ingredients thrown into the pot and what turns out after 6 minutes of pressure cooking. The soup can be made gluten free if you opt substitute gluten free pasta. I used the regular but want to try whole wheat or gluten free the next time I make it. If you are like me and have always wanted to try pressure cooking, I highly recommend an Instant Pot. It makes pressure cooking easy, safe, and simple. In addition to pressure cooking, the pot has other functions such as rice, soup, saute, yogurt and slow cook. The soup function is what I use for soups, and it automatically adjusts pressure cooking time for soup. Do you have an Instant Pot? If so, please share your favorite tips, tricks or recipes! If you try this, do let me hear how it turns out. As always, thanks so much for stopping by. Be blessed, and stay savvy!!! Set Instant Pot to saute mode; wait until display says "hot." Add olive oil, onion, carrot, celery and garlic; saute until softened. Add basil, oregano, salt and pepper. If canned tomatoes are still whole, pulse in a food processor until crushed. 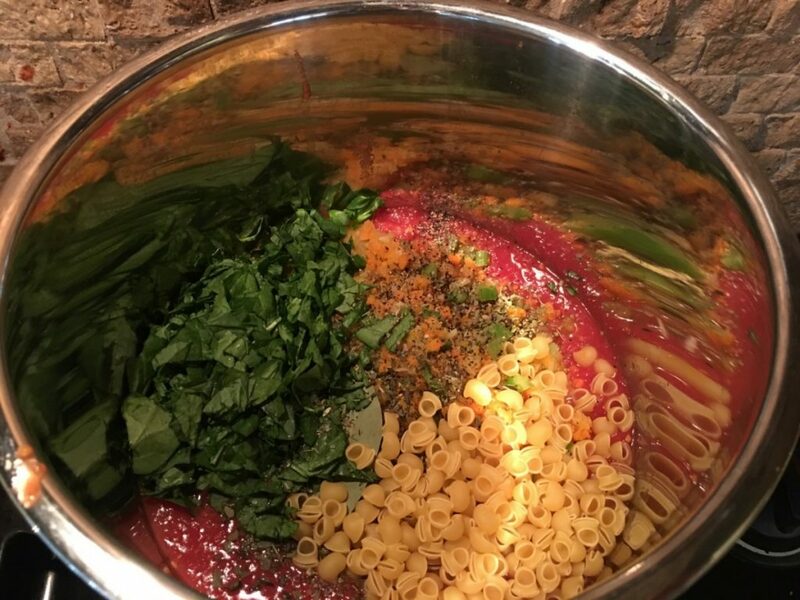 Add tomatoes, broth, spinach, bay leaf, parmesan, pesto and pasta. When timer goes off, let sit for 1-2 minutes. Then set to quick pressure release to vent steam. Remove lid and add white kidney beans; close lid and allow beans several minutes to heat through. Serve in bowls and garnish with additional parmesan cheese. I make this recipe at least a couple times a month especially in the winter months. I follow exactly and add the pesto and makes it so much better it just gives it a full or flavor highly recommend trying it. Dee Dee, I’ll bet the fresh tomatoes took this over the top! Wish I had a tomato garden:-( Thanks so much for letting me know!!! Hi Jamie, Thank you for this recipe – it turned out delicious! I used tomatoes from our garden :) Your instructions and amounts were just right! Hi Robin! So sorry I didn’t include that info. My family of 5 each had a bowl and we had some leftover. I would say it serves 7-8. Hope you enjoy it! I’d love to hear back from you!! Thank you! Can you say how many servings this will make?